Editor's Note: The author of this post is Hayes Brown, a National Security Reporter/Blogger with ThinkProgress.org. This blogpost originally appeared on ThinkProgress. You’d be forgiven for thinking that the Central African Republic — or CAR — was a country conceived for a television show, baring an improbably simple name and lacking much in the way of resources and population. But the country is not only real, it’s in the middle of a spate of lawlessness that has left the population terrorized and the government nearly non-existent. It has been six months since the CAR’s president Francois Bozize was overthrown, ending his ten-year reign in the landlocked country, sending him fleeing to nearby Cameroon. Bozize was no model democrat, having taken power himself in a military coup in 2003. The ragtag collection of rebel groups that swept into the capital of Bangui — known as Seleka, a word that means ‘alliance’ in the Sango language — at least has promised elections in the near year. But it is those same rebels who are currently making life a hell for the citizens of the CAR. When the Seleka started its advancement towards the capital last December, local police and military forces withered away, either donning their civilian clothing to blend in with the populace or melting into the bush. The group that started out as being a small set of bandits numbering no more than five thousand swelled to 20,000 at its peak, facing little to no resistance as they made their way to the country’s seat of power. Unable to offer wages to those who stood in support of them, who included not only locals demanding change but also those from neighboring countries including Chad and the Sudan looking to join the party, the leaders of Seleka instead gave them free license to loot and pillage the country as their reward. The United Nations High Commissioner for Human Rights came to a similar conclusion, issuing a report last week to the U.N. Human Rights Council detailing the human rights abuses seen in the CAR since March. Both sides, according to the report, engaged in “summary executions and extrajudicial killings, enforced disappearances, torture and looting of private and public property.” Adding to the wantonness of the violence, the U.N. also says the Seleka “engaged in sexual violence and grave violations against children,” leading the report to determine that gross human rights violations had occurred, possibly on the level of constituting war crimes. Two weeks ago, CAR president Michel Djotodia, a former Seleka leader who grabbed the reins of power, declared that the umbrella group would henceforth be dissolved. 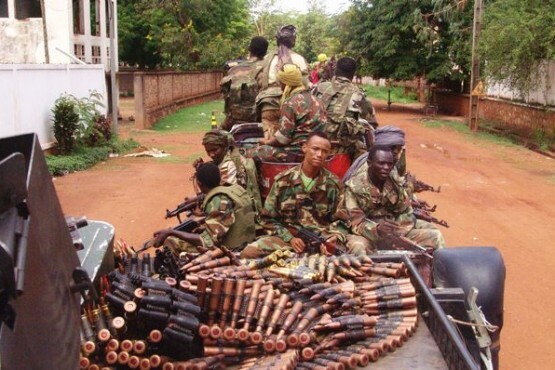 But that order came the same week that fights between Seleka and forces still loyal to Bozize ended with at least 100 dead and with little detail about just how the state’s security forces would enforce disarmament. Unfortunately, Djotodia controls little of what goes on outside of Bangui at this point, according to Enough Project researcher Kasper Agger. Read the full post on ThinkProgress. Photo: Seleka rebels patrol the streets of Bangui in March (Reuters).